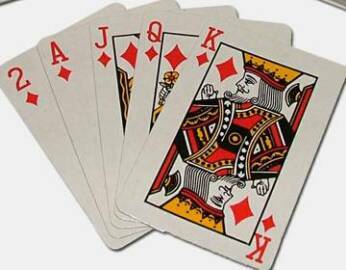 Wholesale Custom Poker or Bridge Cards, Personalized in Bulk. Promotional, Very Inexpensive. Lowest prices in the USA and Canada. High quality, yet inexpensive poker cards in bulk, customized with you logo in 1, 2 3 colors or full color. We manufacture custom bridge-sized and poker-sized playing cards for businesses and individuals seeking a fun and unique way to promote a business or product, commemorate a special event, or even create an entirely new card-based game. American clients pay no taxes. The unit prices below include your custom imprint on the back of each card. The prices are for both poker-sized cards and bridge-sized cards. Prices depend on the number of imprint colors on the back of cards. White color is included since it is the original color of the cards. One color printing allows for a single color plus white. White is not considered a color because the graphics and/or images are printed on white paper. Two color printing allows for two colors plus white. Setup Charge: $38.00 per color. Three color printing allows for three colors plus white. The four color printing process results in a full-color reproduction, and is most frequently used when reproducing photographs or full-color artwork. Please check also our fully custom poker cards with custom imprint on both sides: front and back. IMPRINT COLORS : The poker card or bridge card backs can be fully customized with one, two, three, or full color. Full Bleed imprint is included. PIPS commonly called faces, are the symbols on the card face that determine the suit of the card and its value. We offer pinochle, regular, and jumbo pips, at the same price. Regular and jumbo pips are available in both bridge- and poker sizes. Pinochle pips are available in bridge size only. PACKAGING Our standard packaging for both bridge- and poker-sized cards is a white or black single-window box with an outer wrapping of cellophane. This type of packaging is included in the unit prices: please se the Price Table below. - Custom-printed tuck boxes require a minimum order of 300 decks: contact us for pricing. - Beautiful rosewood boxes are available for poker-sized cards, in both single- and double-deck sizes: contact us for pricing.